The Saturday before Easter I headed to the Wegmans near my Dad’s to pick up items for dinner the next day. If you have ever been to a Wegmans, you know it’s hard to leave there with out coming out with at least half a dozen items you didn’t go in there for. Fourty dollars later, my shopping cart was filled with artichokes, asparagus, gluten-free breads, spinach, bananas, organic salad dressing, vine ripe tomatoes, stalks filled with basil leaves and fresh, hand-made mozzarella. I’m typically not a sucker for those in-store tastings, usually because I don’t eat what they’re sampling. But, that day, they had small pieces of their fresh mozzarella. I couldn’t pass it up. Plus, I had never tried their store brand before. It was over at the first bite. This is one of those dishes you can make a lot or a little depending on how many people/food you have to work with, so you’ll see no set amounts. Slice the tomatoes and mozzarella. Rise and dry the basil leaves. Arrange a single player of the tomato slices on the plate. Top each of them with a basil leaf. Cover with a slice of mozzarella, followed by a slice of tomato. Sprinkle with salt and pepper. Drizzle a little bit of olive oil over the whole plate. Use extra basil leaves to decorate the plate. 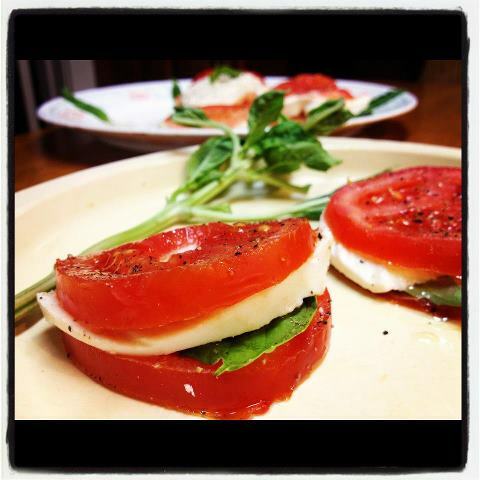 If you’re using a circular plate, top the center tomato ‘sandwich’ with a slice of mozzarella for a nice contrast. Looks yummy, I don't like tomatoes thou. The hub's does but I'd have to remove the cheese… They look so yummy thou and tempting.